Is there an issue with accountability in education? This comic (and its variants) has made the rounds on my social media outlets a few times over the past couple months, and practically everyone who has shared it stated something about the overwhelming and disappointing truth to the matter. Something has happened in recent years that shifted the blame for poor student performance on everything but the students themselves. The comic had me questioning, is there an issue with accountability in education today? In this case, it’s the teachers who get the short end of the stick because parents today seem to think that their children are completely blameless when something goes wrong; parents seem to think that they are completely blameless as well. Of course, this is an incredible generalization since not all parents think that their child is blameless when it comes to school performance, and not all teachers work with their students’ best interests at heart. That being said, the issue at the heart of this comic is that parents today don’t seem to play as big a part in their child’s education, until the results come out differently than what they expected. Then they become increasingly defensive and pin the source of the problem on an outsider. Since the child’s grades are a reflection of his/her abilities (which is a problem in and of itself as we’ve often mentioned), if they should turn out bad, then what does that say about the child and, ultimately, the parent? It should say that he didn’t try hard enough, or that he didn’t understand the task appointed to him, or he simply didn’t care enough. Assuming that the teacher did everything she could to get the subject across, if a student doesn’t pass, it should be on him. But as the comic shows, it doesn’t matter what the teacher did or didn’t do in the classroom, all that matters to the parents is what the child says and what the grades say. The parents will never know the full truth, because they don’t have an active enough role in their children’s education. Now, if say, the parents were helping the child study this whole time, and the student still failed, then perhaps this confrontation would be more valid, since there would seem to be a differentiation in grading standards. But, in this two-panel comic, I think it’s safe to assume that the parents here are not so involved. So why do so many people identify with this sentiment that parents today are more apt to blame the educators than to see any sort of responsibility within the home? There are obviously deep psychological and cultural reasons behind all this that’s a research dissertation just waiting to happen. But, for the sake of this blog, I can only say that this emanates from changing times. Naturally, the way things were handled in the past aren’t always relevant in today’s technological age. Family dynamics are not the same; children are raised with different values, standards, and opportunities, and parents, as a whole, are busier than ever before. I think that because parents are working so much harder and longer to provide better lives for their children, they feel as though all their hard work should reflect back on them through their children. There is nothing wrong with that, but perhaps it’s not always remembered that the children also have some accountability in their own lives. 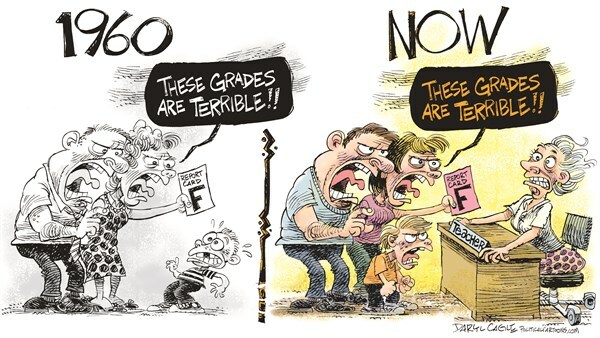 So when a bad grade is brought home it’s not solely the fault of the outsider (teachers), but a disconnection between all sides involved. I happen to agree with the sentiment in the comic because in my experiences in working with children, there seems to be a “my child is perfect regardless of what you say,” mentality amongst some parents that tends to blame everything negative on the “outsider.” A mentality that seems to be prevalent in society, especially when it comes to education – seeing as how policy makers are much more apt to blame only educators for the failures of our educational system. So what does everyone else think of this comic? What are your opinions on the comic’s intent – showing a shift in parent/teacher relationships? Share your thoughts with us.